A Conceptual Study was completed by BBA for the Aymaraes Iron Ore Project on 24 October 2013. The study assessed the economic viability of building and operating a stand-alone mine and returned positive results. BBA’s report is based on the development of in-pit Mineral Resources of 362.8 Mt at a grade of 46.78% TFe, with production of 8.3 or 16.6 Mt/y of high grade magnetic concentrate over a projected mine life of 26 or 13 years respectively. The project’s economic evaluation was performed using a discounted cash flow model on a pre-tax basis. A commodity selling price of US$110 per tonne for concentrate at 62% Fe landed at port in China was assumed, based on a Platts benchmark and US$5/%Fe premium for a concentrate grade higher than 62% Fe. 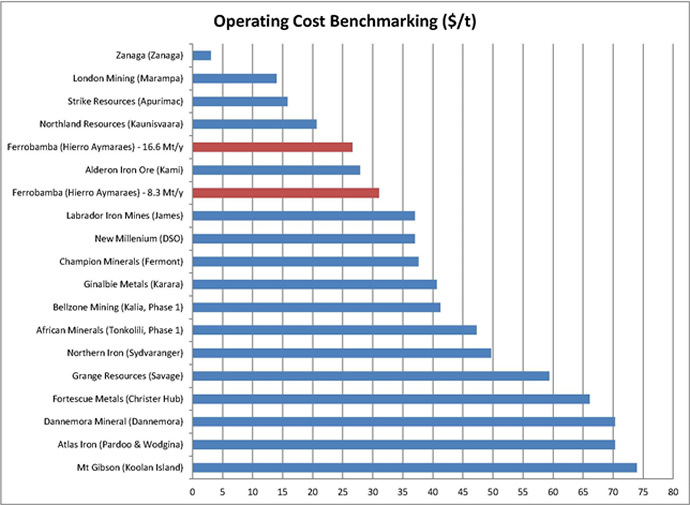 The Aymaraes Iron Ore Project is at the lower end of industry Operating Cost Benchmarks ($/t). As such, the project’s financial performance is indicated to be attractive for both production tonnages considered in the BBA study. Process plant design and the conceptual flowsheet are simple; primary and secondary crushing, followed by high pressure grinding rolls, magnetic separation and flotation. The concentrate will be produced onsite and transported by pipeline to filtering operations at the port facility on the coast at Marcona. A number of optimizations may be possible and will be looked at in more detail during the pre-feasibility study. JRI pipeline consultants conducted a Conceptual Study level report for slurry pipeline transportation, filtering and ship loading operations sequences for the Aymaraes Project concentrate. The pipeline will follow national road corridor and requires minimal land access negotiations. The results of the JRI study were used by BBA in its Conceptual Study. BBA believes that the development of the Aymaraes Project can be supported by projected growth in global crude steel production and the need for high quality iron ore concentrates to blend with lower quality products entering China, especially from mines in Australia. A premium is normally paid for iron ore products grading above 62% Fe. For further information please contact us at info@ferrobamba.com.